Playing all day in Genting Highland sure made my tummy rumble. It was nearly 9p.m. when we head down to K.L. 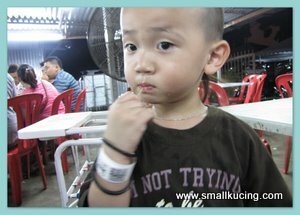 Happy to say that when we arrived K.L that night, we did not encountered horrible traffic jam and road blocks. Papa suggested we try out this N&J Restaurant. Many thanks to Uncle Mac for helping us to locate this restaurant. Too big for Baby Chair. I don't care. I want jugak. Ordered some BBQ cockles(RM5). 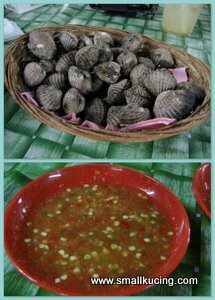 Taste good with the Cili Sauce. Kerabu Kaki Ayam(RM8). Yumm...not bad. A bit too fiery for Mamarazzi and yet she walloped half a plate of this. 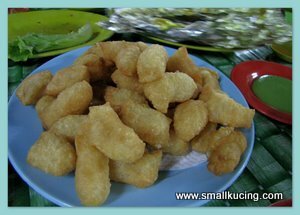 Prawn Cakes(RM10). Mamarazzi loves it. Can really sees the prawns meat in it. 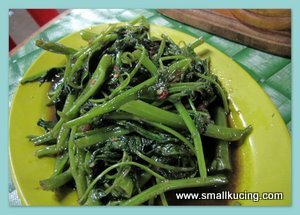 Fried Kangkung with Sambal Belacan (RM9). Mamarazzi personally thinks its a bit expensive but taste wise ok.
Coming to Thai Restaurant if don't order Tomyam (RM11) will feel like something not complete. We had Seafood Tomyam. 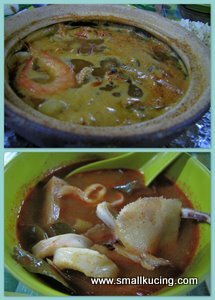 The taste of this Tomyam is different when compared to what we had in other places. Yes, we like it. 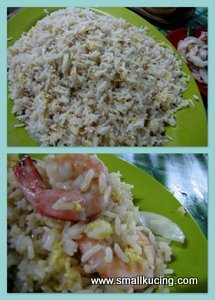 Fried rice for 4 person(RM5/person). When Mamarazzi saw the Fried Rice, she was thinking "HAH? So plain. Eggs and rice only?" But then when we scooped the rice onto our plates, we discovered that "ada udang disebalik nasi". Hidden in the rice were quite a number of large size prawns. Sweet and juicy prawns. Despite lack of vegetable, the rice still taste good. If only they'll add some vegetables in it then it would be prefect. 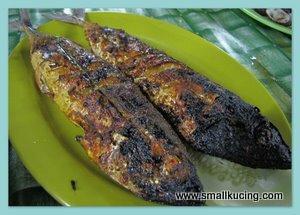 BBQ Ikan Kembong(RM6 each). Papa likes it. 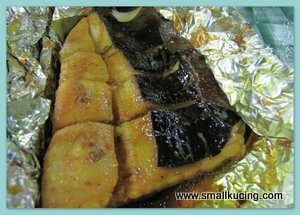 BBQ Stingray (RM12). There was a bit of funny smell so we did not finish this. These Yau Char Kwai(RM6) was supposed to come before others food but the one who took our orders had forgotten to place the order for us. Papa's colleagues all said they are very full already. Huh...such small eaters. For a moment there, Mamarazzi thought they won't be able to finish these. But she was wrong. Taste good with the Pandan Kaya. The Pandan Kaya have a nice aroma although it's a bit too sweet in Mamarazzi's personal opinion. Overall, it was a good dinner. Next time must ajak more people who can eat a lot punya and come here to try out their other offers such as BBQ crabs, sotong and shrimps. I want! I want! Drool...drool...but leave out the chicken feet! Eyewwwwww....!!! And I think I don't want the cockles either...I like very much but people say not good for health. For Thai cuisine, I'll normally have their fried rice. I saw my favourite prawns!!! Came by to see what was going on !! The good looks yummy! I love ethnic foods.. With Amit being Indian when I first started dated him it was a lot of fun to go out to Indian restaurants with him and he would tell me what I should order, what he thinks I would like and what he likes! I hope you are having a wonderful evening ! 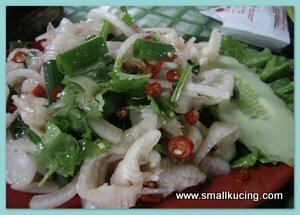 This is so tempting, how not to drool esp with kerang rebus and the kerabu kaki ayam? another one to our type of food we simply love. wow...its adventurous of you. Many would not dare to try out asian dishes. I love indian food too. That one not kerang rebus. 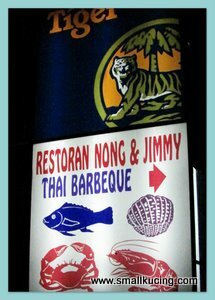 They grill the kerang. Nice. i hvn't done bbq for quite some time. Nong nong, I am angry bird....need some bird eye chilly tomyam......nong nong! ha ha ha! Yan Yan is the opposite of your small kucing - she sometimes refuse to sit on baby chair even though the adult chairs are way to big for her! Not bad la. But each person different taste. BookXcess 4th Anniversary & Great Offers! Street Food at Jalan Alor, Kuala Lumpur.